Sediments associated with dredging and flood plumes could have a significant impact on fish populations by extending the time required for the development of their larvae, according to Australian researchers. 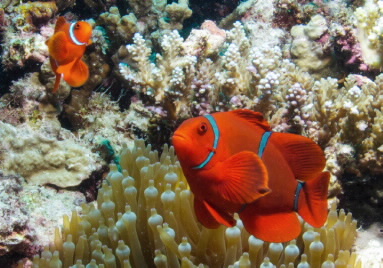 “Sediment concentrations at levels found in plumes from dredging or in floods cause a significant delay in the development of clownfish larvae,” says study lead author, Dr Amelia Wenger, from the ARC Centre of Excellence for Coral Reef Studies (Coral CoE) at James Cook University. “This in turn could significantly reduce the numbers of larvae competent to settle on reefs and could have a major effect on adult populations,” Dr Wenger says. As part of the study examining the impact of sediment on young fish, researchers took five-day-old clownfish larvae and raised them under four different sediment levels. Larvae raised in even slightly elevated sediment took much longer to develop than those raised in the absence of sediment. In many cases larval development time doubled from the normal 11 days to 22 days. Dr Wenger explains that this delay is a significant problem for fish because they are at their most vulnerable during this stage of development. “The pelagic larval stage is when you get the highest level of mortality, so the longer fish spend as larvae the less likely they are to survive,” she says. “During this time they can be in open water away from the protection of the reef so if a fish is spending twice as long in this stage it means their risk from predators is greatly increased,” Dr Wenger says. Researchers say this will have a big impact on population dynamics for fish exposed to sediment levels associated with dredging and flood plumes. Study co-author, Professor Geoff Jones from Coral CoE, says that with the exception of a few species, almost all fish have a pelagic larval stage, so this is something that they could all experience. “We don’t know if all fish are going to be as sensitive to sediment as clownfish, but if you don’t get new recruits into a population then you won’t have any new ones to replace the adults when they die off,” Professor Jones says.